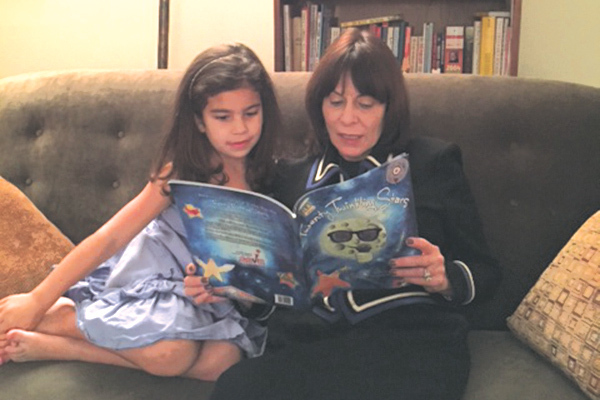 Laurie Schloff reads from her new book, Twenty Twinkling Stars, with kindergartener Emily Moss. Communications expert Laurie Schloff has written two books for adults. Her latest work is for a very different audience, but it was inspired by the same impulse — to provide encouragement to those who might be feeling vulnerable. 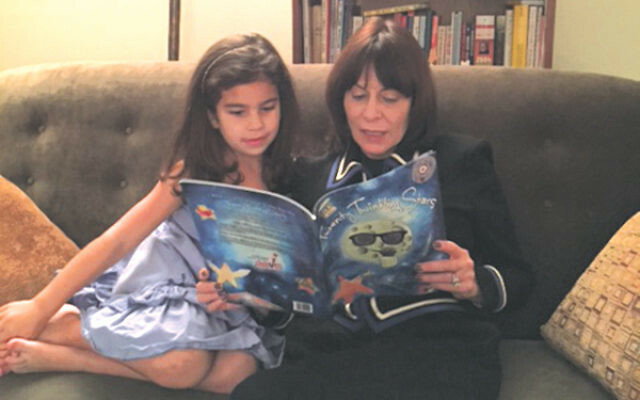 Her children’s book, Twenty Twinkling Stars, is about all different kinds of people in the world, with their varied traits. Though not directly representing them, it is a tribute to the children shot dead on Dec. 12, 2012, at the Sandy Hook Elementary School in Newtown, Conn.
She and her mother, Gertrude Schloff, who lives in Westfield, are both lifetime members of Hadassah. Laurie said she learned from her mother a commitment to working for tikun olam, to repair the world. The proceeds from sales of the book are going to benefit the National Association of Students Against Violence Everywhere, or SAVE, a 25-year-old organization that involves youth in conflict resolution, anti-bullying, and violence prevention projects. It has 2,100 chapters in 48 states, with more than 230,000 young adult members.